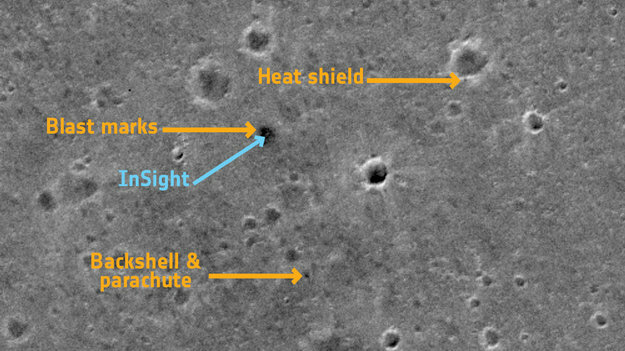 March 17, 2019 – Curious surface features, water-formed minerals, 3D stereo views, and even a sighting of the InSight lander showcase the impressive range of imaging capabilities of the ExoMars Trace Gas Orbiter. The ESA-Roscosmos Trace Gas Orbiter, or TGO, launched on March 14, 2016. It arrived at Mars on October 19 that year, and spent over a year demonstrating the aerobraking technique needed to reach its science orbit, starting its prime mission at the end of April 2018. In a new showcase of images from the spacecraft’s Color and Stereo Surface Imaging System, CaSSIS, is an image of NASA’s InSight lander – the first time a European instrument has identified a lander on the Red Planet. Insight arrived on Mars on November 26, 2018 to study the interior of the planet. Images of the lander have already been returned by NASA’s Mars Reconnaissance Orbiter; these are the first images from TGO. The panchromatic image presented here was captured by CaSSIS on March 2, 2019, and covers an area of about 2.25 x 2.25 km. At that time, InSight was hammering a probe into the surface in order to measure heat coming from inside the planet. The CaSSIS view shows InSight as a slightly brighter dot in the center of the dark patch produced when the lander fired its retro rockets, just before touchdown in the Elysium Planitia region of Mars, and disturbed the surface dust. The heat shield released just before landing can also be seen on the edge of a crater, and the backshell used to protect the lander during descent is also identified. CaSSIS is expected to provide additional support to the InSight team by observing the surface of Mars in the area surrounding the lander. If the seismometer picks up a signal, the source might be a meteorite impact. One of CaSSIS’s tasks will be to help search for the impact site, which will allow the InSight team to better constrain the internal properties of Mars near the landing site. The image of InSight also demonstrates that CaSSIS will be able to take pictures of the future ExoMars mission. The mission comprises a rover – named Rosalind Franklin – together with a surface science platform, and is due to launch in July 2020, arriving at Mars in March 2021. TGO will also act as the data relay for the rover. Also released is a selection of images capturing the impressive science capabilities of CaSSIS, ranging from high-resolution views of intriguing surface features and images that highlight the diversity of minerals on the surface, to 3D stereo views and digital terrain models. 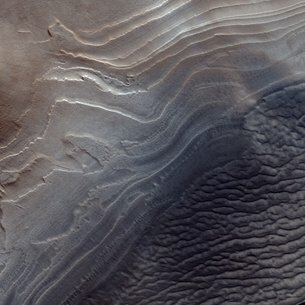 The images selected include detailed views of layered deposits in the polar regions, the dynamic nature of Mars dunes, and the surface effects of converging dust devils. The stereo images bring the scenes alive by providing extra insight into elevation differences, which is essential for deciphering the history in which different layers and deposits were laid down. 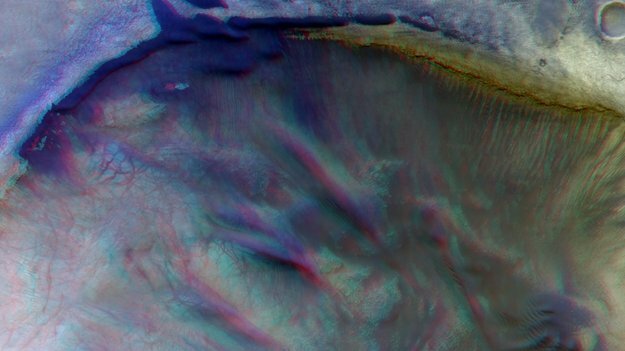 Color-composite images are processed to better highlight the contrast of surface features. Combined with data from other instruments, this allows scientists to trace out regions that have been influenced by water, for example. These images can also be used to help guide surface exploration missions and provide broader regional context for landers and rovers.